The first 2018 AEC champions were crowned today! Shown here: Jr. Training winners Madison Santley and Excellence. Photo by USEA/Leslie Mintz. 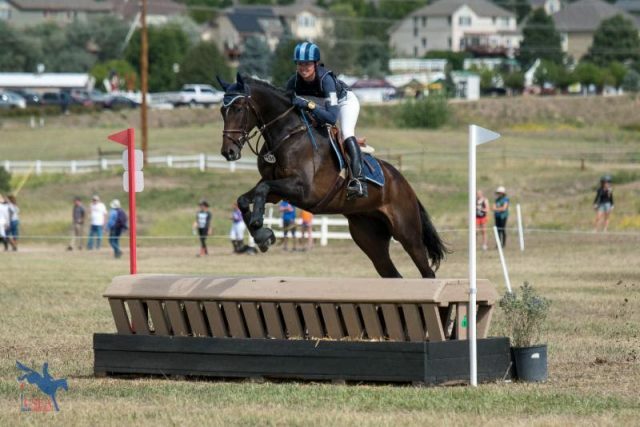 The American Eventing Championships is no ordinary event. There’s no hierarchy of prestige here: Every last competitor earned his or her place on the entry list, and nobody’s journey was easy. At the AEC, Beginner Novice is just as important as Advanced. 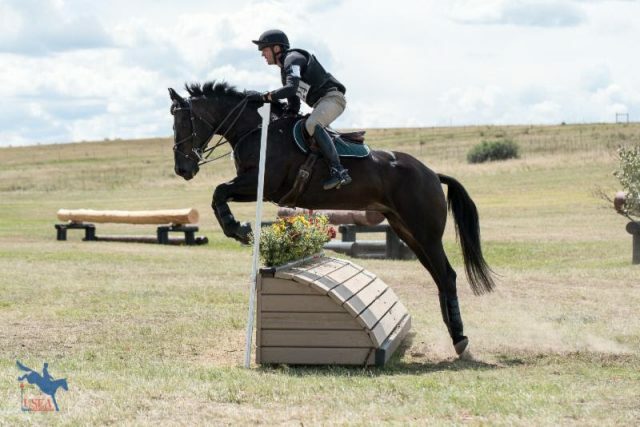 While the jumps may be smaller or larger, the obstacles competitors faced to get here — whether it’s the adult amateur working mom who rides at 5 a.m. because it’s the only time she has, or the professionals who risk everything to hedge their bets on a dream — are all worthy of our respect, and all the riders worthy of our admiration. That’s why, instead of just focusing on the upper levels, this week we are striving to shine the spotlight on all the championship divisions. But we can’t do it alone — the AEC is simply too expansive. 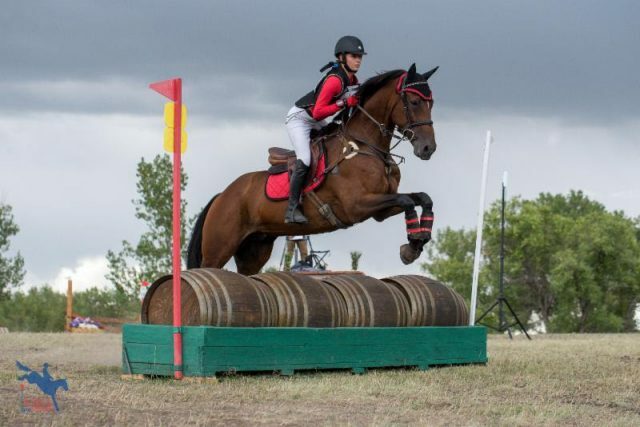 The comprehensive AEC coverage EN has shared this week would not have been possible without the media teams of the USEA and Colorado Horse Park, who have been working feverishly to make sure each and every division gets the attention it deserves. Even at this moment, with the competitors’ party in full swing just outside the media center, they are hunkered down at their laptops, writing and editing photos, all in the name of sharing AEC rider stories and celebrating their successes with the larger eventing community. Thank you Leslie Mintz and Jessica Duffy of the USEA, and Kim Beaudoin and Kristin Rashid of the Colorado Horse Park. Teamwork makes the dream work! Heather Morris and Charlie Tango. USEA/Leslie Mintz Photo. >Heather Morris of California and Charlie Tango, the Team Express Group, LLC’s 2008 Irish Sport Horse gelding (Shannondale Sarco St. Ghyvan x Our Queen Bee), jumped around the cross country course clear to continue to lead on their dressage score of 25.8. Bella Mowbray of California and Ruth Bley’s En Vogue, a 2005 Hanoverian mare (Earl x Laurena), are 2nd on their score of 30.5, followed closely by Julie Wolfert and Iowa Lot of Money, her own 2011 Thoroughbred gelding (Fusaichi Pegasus x Lion N Cheatin), on a 33.1. Julia Spatt of Arkansas and 5o1 Macintosh quietly stalked the leaders all weekend, sitting in a respectable tie for seventh place on a score of 34.3 following dressage and then moving up into second place after adding just 0.8 time faults on cross country day. Finally, Spatt and her own 2010 Belgian Warmblood gelding turned in a double clean show jumping round this afternoon to take home the title. Second place went to Erin Hofmann and her own Darkwatch (Royal Academy x Without), a 2008 Thoroughbred gelding. The pair moved from fifth to first with a double clear cross country round and dropped back into second-place after pulling a single rail in show jumping. 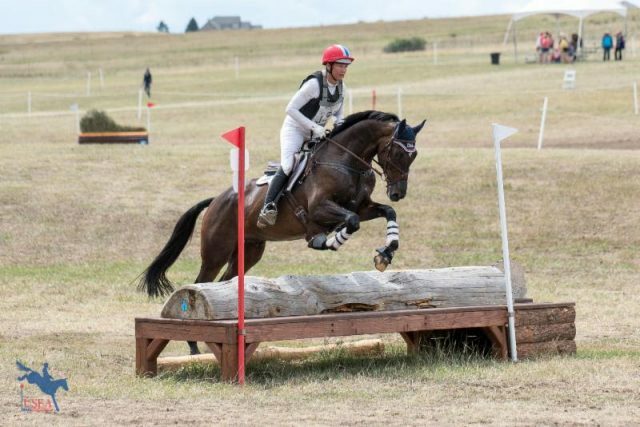 Ruth Bley and her own 2005 Selle Francais gelding Rodrigue Du Granit (Robin II Z x Delight Gee) started and finished the competition in third place, dropping back to fourth after cross country with 6.0 time faults, but moving back up into third with a flawless show jumping round. 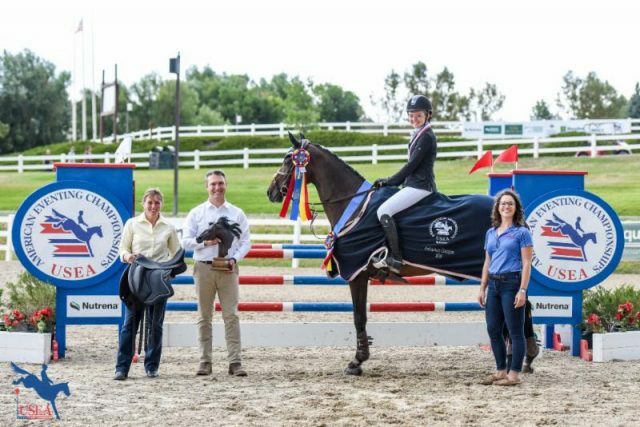 Places shifted and changed once more in the Preliminary Rider division, which saw Californian Whitney Tucker Billeter guide her own 2011 Irish Sport Horse gelding Karvaleo (Kanna x Finod Cavalier) to the blue ribbon. The duo earned a collective score of 70.3. “This is my first AEC and it’s beautiful here. I want to come live here during the summer!” Billeter exclaimed. Due to yesterday’s inclement weather, the Preliminary Rider division was sent back to the barn before they were set to run cross country. The group resumed on Saturday morning, and then contested their final phase later in the afternoon. Madelyn Floyd and Clementine. Photo by USEA/Leslie Mintz. “The cross country course was difficult! He’s such a good boy on cross country. He just ate everything up and had a lot of fun with it,” said Englund. Yesterday’s course was influential in the Preliminary Horse division, which gave Tamie Smith the opportunity to climb up the leaderboard into first. Once Smith had the lead, she wasn’t letting go of it and a double clear show jumping round secured her win. Riding Judith McSwain’s Fleeceworks Ghost, a 2012 Irish Sport Horse/Belgian Warmblood mare (Dhannondale Sarco x Riverlon Mist), Smith finished on her dressage score of 29.0. Second-place was captured by another California native, Gina Economou, riding Lauren Rath’s 2005 Thoroughbred gelding (Devil His Due x Synful Maid), who also finished on their dressage score of 30.4. Of her experience at CHP, Economou said, “They did a fabulous job here. It’s so nice to have an AEC that is in the Midwest and to have one that we could make it to. It was wonderful this year. McKenzie Rollins and Excel Star Lord. Photo by USEA/Leslie Mintz. 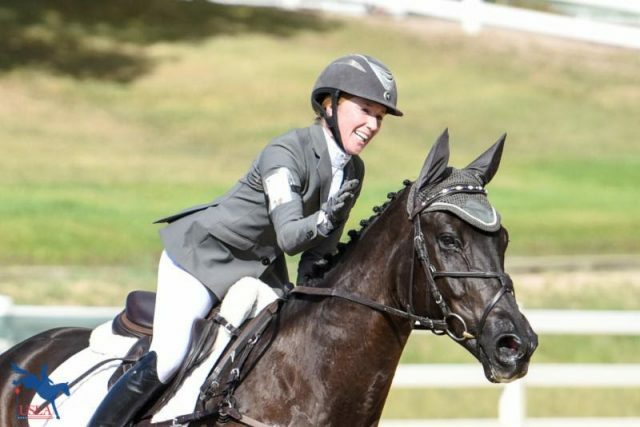 Rollins moved from first place after dressage into second place after cross country with her own Excel Star Lord, a 2012 Irish Sport Horse gelding (Non-Stop x Korea B), then clinched the victory on a score of 34.9. Second-place was awarded to Sam Kelly of Minnesota aboard Robinstown Ballivor, her own 2009 Irish Sport Horse gelding (Watermill Swatch x Coevers Dock). The pair made a comeback from fifth place after cross country to end on 37.5 penalties. 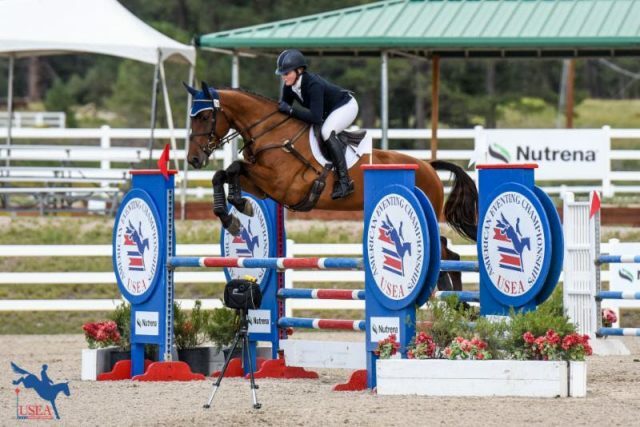 The Junior Training division concluded with Madison Santley of California, who moved to finish on top of the podium aboard Excellence, a 2009 Dutch Warmblood gelding (Vaillant x Wolinda), after clear rounds in both jumping phases. Linda Quist and Belle Gambe. Photo by USEA/Leslie Mintz. Linda Quist of Colorado led from start to finish aboard her own Belle Gambe, a 2004 Iberian Warmblood mare (Temerario VII x Mojave), in the Training Amateur division, finishing on a score of 27.3. 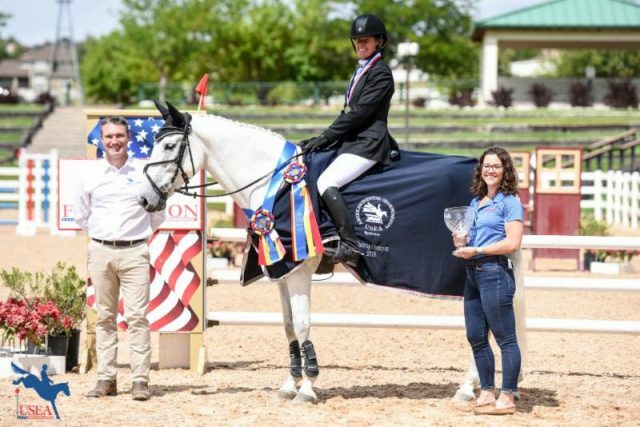 Texan Cherye Huber and her own Sam I Am, a 2006 British Sport Horse gelding (Cameo’s Reflection x Castle War Rebel), captured third place with a total score of 34.2. This is Huber’s fourth AEC and the time surrounded by her fellow competitors was one she will remember fondly. Tracy Alvez and Romulus. Photo by USEA/Leslie Mintz. Jessica Maranto used her home field advantage to take home the reserve championship in the Training Rider division. “I liked having the AEC here this year because I live about five minutes from here,” said Maranto. 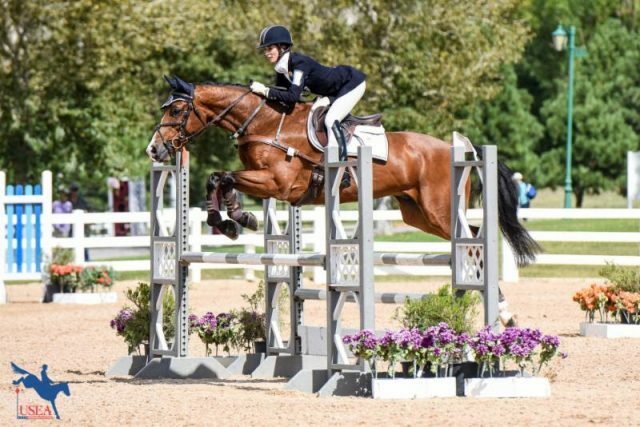 She and Czardus, a 2007 American Warmblood gelding (Sweet’s Lucky Moondancer x Cadence), made a steady climb up the leaderboard throughout the weekend. They sat in seventh on a 32.8 after dressage and added nothing to that score in either jump phase. Erin Contino and Handsome Ransom. Photo by USEA/Jessica Duffy. In the Novice Amateur division, the top three riders held on to their placings. 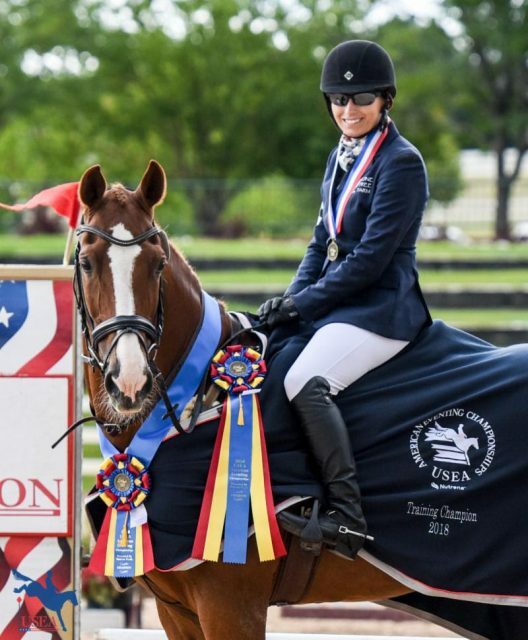 Erin Contino of Colorado and Handsome Ransom, her 2012 Thoroughbred gelding (Desert Warrior x St. Casmir’s Secret), earned a 25.8 yesterday in dressage to lead the division. Contino said she felt very pleased with her steady mount as she guided him faultlessly around the cross country course. Michelle Meghrouni of California and Swizzle, a 2011 Holsteiner mare (Blauer Vogel x Swiss Detail), sit in second place on a score of 27.0. The third place pair, Lorilee Hanson of Washington and Hypnotik, her own 2011 Warmblood/Thoroughbred gelding (Montego Bay x Trelawny), are half a point behind on a 27.5. Julia Brittain and Haiku. Photo by USEA/Jessica Duffy. Yesterday Julia Brittain of California, riding her own Haiku, a 2012 Dutch Warmblood gelding by Sir Donnerhall, earned a 29.2 for first place. They jumped clear and inside the time today on cross country to maintain their impressive lead. Amanda Boyce, also of California, and her own 2006 Welsh Cob gelding Mercury (Machno Carwyn), sit in second place on a score of 32.3. Madison Boesch and her own Seamless, a 2009 Warmblood mare, moved into third on 33.3 with a clear round. Tamra Smith and MB MaiStein. Photo by USEA/Jessica Duffy. Tamra Smith sits in yet another top place position moving into Sunday’s show jumping phase in the Novice Horse division. This time she’s aboard MB MaiStein, the MB Group LLC’s 2013 Oldenburg gelding, on a score of 28.1. 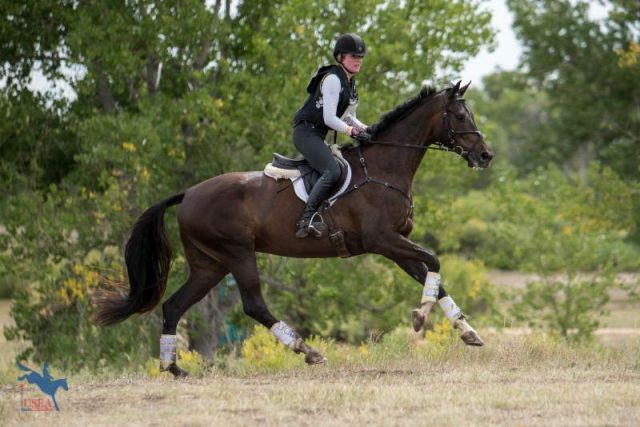 Colorado’s own Madeline Backus is sitting in second on her dressage score of 29.5 with Reflektion’s Rio, Lynn Roberts’ 2007 Swedish Warmblood gelding (Reggasoni x L.A. Baltic Reflektion). Whitney Tucker Billeter of California is also heading into tomorrow’s final phase on her dressage score of 31.0, holding third place, and the reins of Bill’s MidnightMagic, John Herich’s 2004 Hanoverian gelding (Espri x Rena Ramzi). Chris Kawcak and Maggie Belle. Photo by USEA/Jessica Duffy. 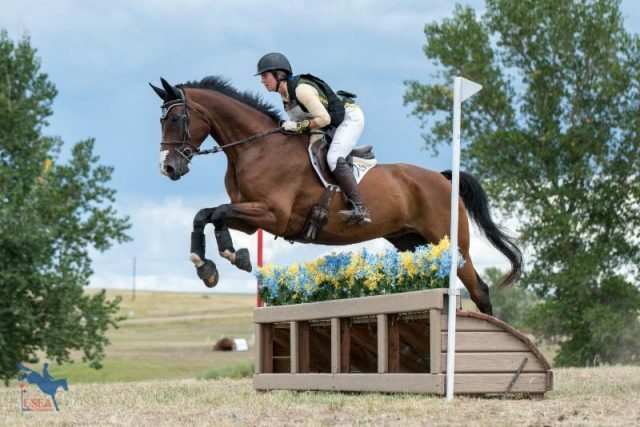 The Novice Rider division saw a new combination rise to the top of the leaderboard as Colorado’s Chris Kawcak and his own Maggie Belle, a 2003 Canadian Warmblood mare, took over the lead after cross country. They head into the final phase tomorrow on a score of 25.0. “I grew up riding team roping horses and I just started riding her about three-years ago,” said Kawcak, whose wife Erin Contino is currently sitting atop the Novice Amateur division. 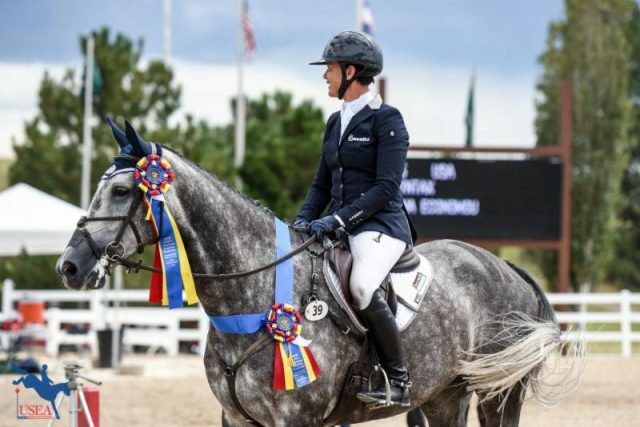 Kansas native Anna Howell piloted her own 2003 Thoroughbred-Shire gelding (Kaeson’s Tuxedo Affair x Exclusive Ballerina) to second in the standings, with a score of 25.2. Julie Kuhle of Iowa and her own Orion, a 2008 Appaloosa Sport Horse gelding (JS Ebony N Ivory x Lucinda), sit in third on a 26.0. Alexa Ehlers of Kentucky and Clear Laveer, her own 2006 Hanoverian gelding (Rascalino x Hauptstutbuch Wincenta 2), cruised around clear out on cross country to lead on their dressage score of 27.4. Taylor Lindsten of Arizona and Chestnut Oak’s Drummer Boy, Claudia Channing’s 2007 Shire gelding (Clononeen Romantic Traveler x Steege’s Beth), remain on their score of 25.0 for second place, followed closely by Sophie Mueller of Colorado and 24Karat Magic, Dawn Holmes’ 2011 Australian Stock Horse gelding by Icewood’s Cadabra, on a score of 29.6. Haley Miller and Mr. Melvin. Photo by USEA/Jessica Duffy. 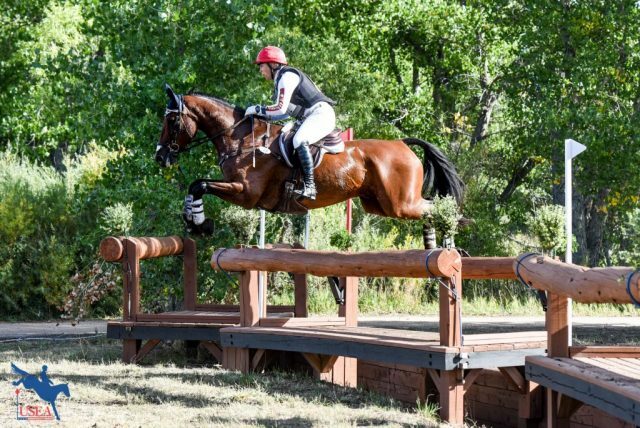 When the dressage leader of the Junior Beginner Novice division ran into some trouble on cross country, Haley Miller and Mr. Melvin were ready to step into the lead with a double clear round. Miller and her own 2011 Thoroughbred gelding (Compromise x Leona’s Hope) sit on a score of 29.1 heading into show jumping. 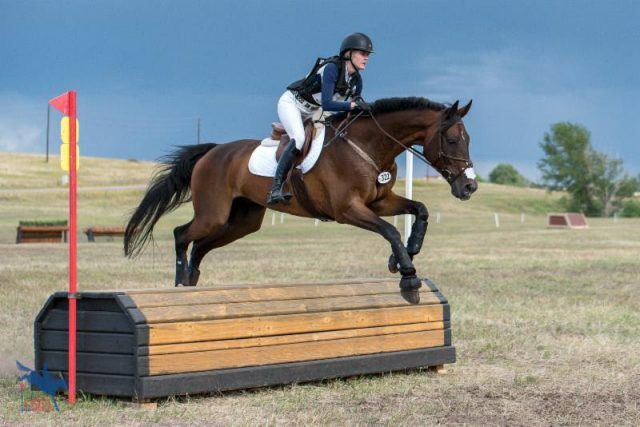 Sitting on a 30.3 and in a tie for second are Californian Maya Pessin and This Bird, her own 2009 Thoroughbred gelding, and Texan Ella Robinson and Fernhill Fearless des Terdrix, her own 2010 Dutch Warmblood gelding (Nabab de Reve x Untouchable). Tricia Leslie and Inate Dignity. Photo by USEA/Jessica Duffy. Beginner Novice Rider was one of five divisions that were not able to complete yesterday due to the weather, so the riders performed their dressage tests this morning before setting out on cross country this afternoon. Tricia Leslie of Colorado and her own Inate Dignity, a 2006 Thoroughbred gelding (Subordination x Indygo), held the lead following dressage on 23.3 and added nothing to their score on cross country. Fifth-placed Liz Reilman and her own Diamondexpectation, a 2004 Thoroughbred gelding (Valid Expectations x Appeasement), moved up to second place on their dressage score of 29.8 following cross country. Sixth-placed Sarah Sousa and Black Tye Affair, her own 2002 Thoroughbred gelding (Haymarket x Gone Lady), also jumped up the leaderboard into third-place on 31.5 after putting in a double clear round. Cami Pease and Vibrant. Photo by USEA/Jessica Duffy. 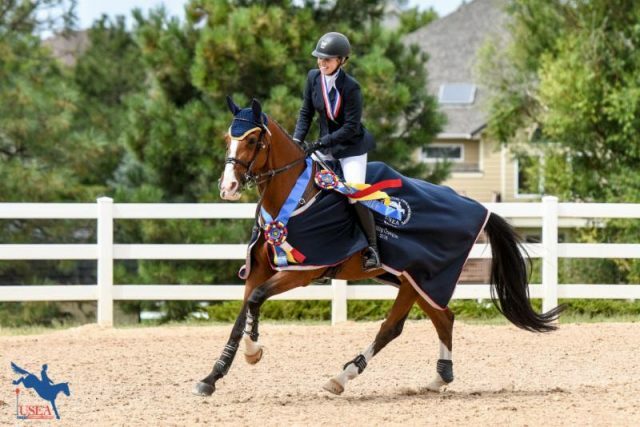 Washington D.C.’s Cami Pease and her own Vibrant, a 2000 Belgian Warmblood gelding, dominated the Beginner Novice Amateur division today and lead on a score of 24.5. They have a rail in hand heading into show jumping tomorrow. 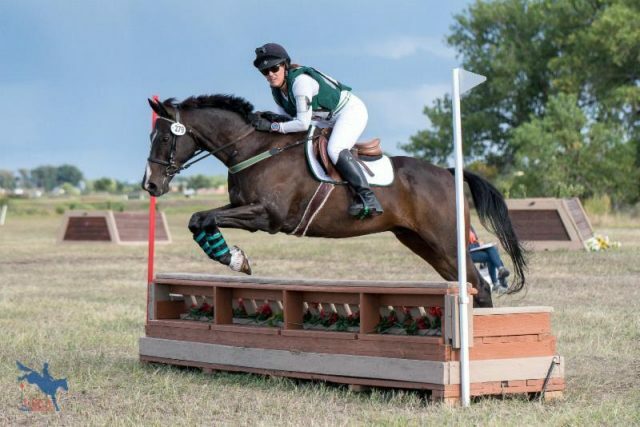 Kelly Green of Texas piloted her own Woodstock Classic Rock, a 2009 Thoroughbred gelding (Rock Slide x Sally Q), to second place on a score of 28.5, while California resident Nikki Lloyd and Wil’ya Dance, a 2012 Hanoverian gelding (Wild Dance x Paloma Paz), sit third on a 29.3.